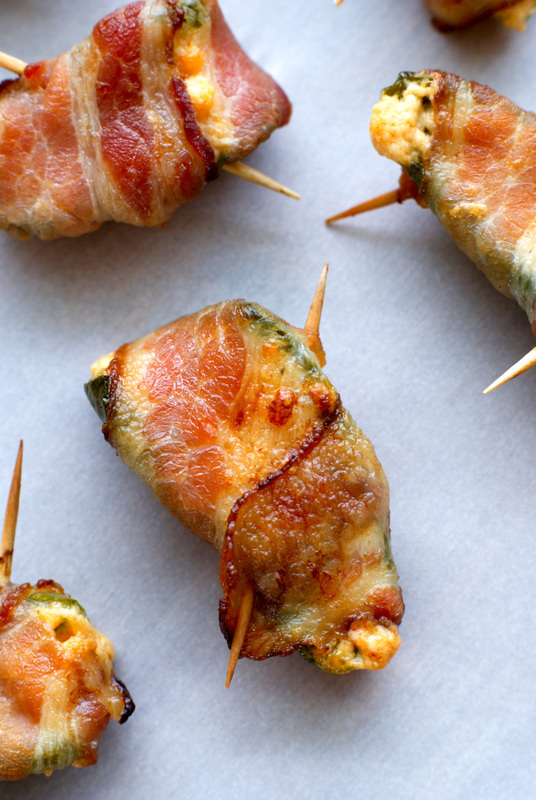 Bacon-Wrapped Jalapeño Poppers are an irresistible party food appetizer that combines spicy jalapeños, two kinds of cheese, and smoky bacon. They are baked in the oven until the cheese is melty and the bacon is crisp! I never in a million years would have thought that one day I would say that I am a jalapeño popper lover. Too spicy for sure, I always thought. Then, as my taste buds slowly became more tough to spicier and spicier flavors, I decided to be brave and give them a go. 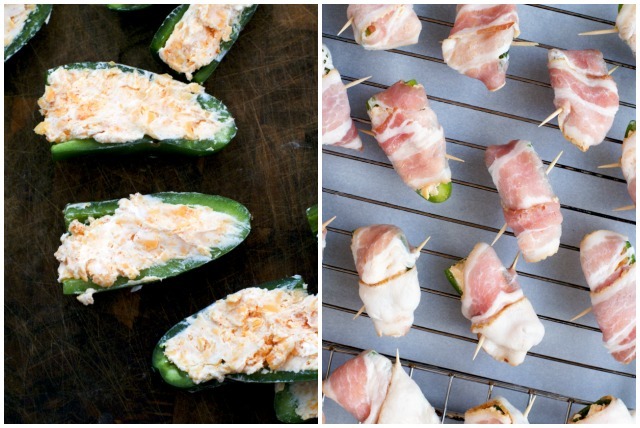 I am a jalapeño popper lover. 100%. My go-to recipe for years has always been my Bakes Jalapeño Poppers that are coated with a crunchy panko coating. They are ah-mazing and a few summers back when I had jalapeños coming out of my ears (thank you backyard vegetable garden), I made them all the time. I plan on growing many many more jalapeños in my time, so I'm working on expanding my popper recipe collection. 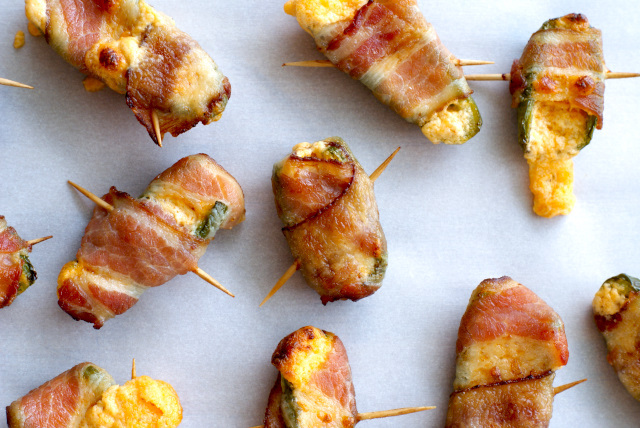 Bacon goes with jalapeño poppers like peas go with carrots, so naturally I had to try a bacon-wrapped popper! They are a little more indulgent than my usual recipe, what with being wrapped in bacon and all, but good Lord are they good. My poppers oozed more cheese than I would have like because I had to cut the tips off of some of them because they were starting to go bad. Keep them like little boats and it will help the cheese stay put. Stuff em, wrap em, secure em with a toothpick, and bake them on a rack. I like to make these up on a rack so that they drip off some of the bacon grease as they bake. When they're done, they are beautiful golden, salty, spicy, smoky, cheesy, little bites of jalapeño heaven. I mean just look at them. Tell me you don't want to inhale the whole pan. If you told me that, I wouldn't believe you. Who wouldn't want to pop some of those good looking poppers?! Now, not all jalapeños are the same size, so you may need to adjust the amount of filling depending on how big yours are. It's pretty easy to mix up a little more filling if need be. I promise you, one you try them, you will want to make them again and again. They are perfect for a barbecue, perfect for a party, perfect for game day, or perfect just because! Cut the jalapenos in half lengthwise (Don't cut off the whole stem end. Cut the stem flush, keeping the jalapeno like a boat.) Scrape out the seeds and white membrane. In a bowl, combine the cream cheese, cheddar cheese, paprika, and garlic powder. Stuff the cream cheese mixture into the jalapenos. 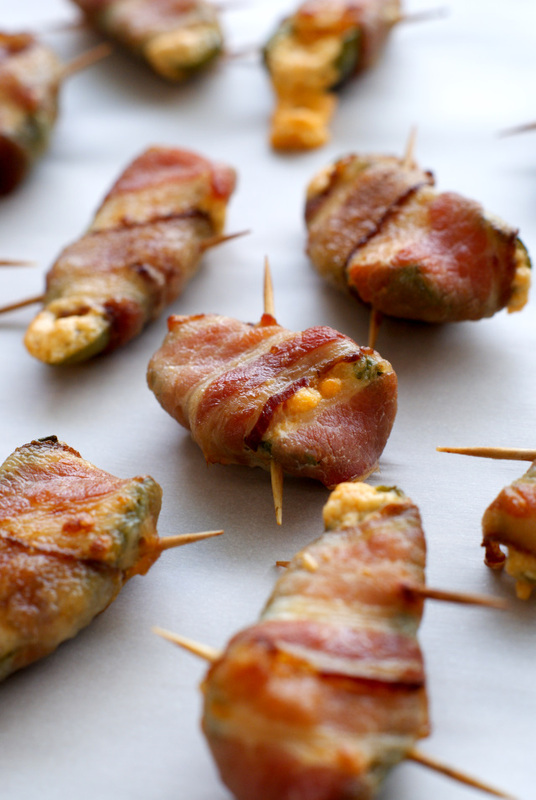 Wrap each jalapeno with a half a piece of bacon and secure with a toothpick. Place the jalapenos on a rack over a cookie sheet. Bake in the preheated oven for 20 minutes. Broil for 1 minute to crisp bacon even more, if desired. My husband was a big fan of these as is. Some of the cheese oozed out because I had to cut the ends off of some of my jalapenos because they were starting to turn, but the cheese that oozed out cooked on the baking sheet into tasty little cheese crisps cooked in bacon grease, which were sooo yummy. I think next time I will pop them in the freezer for 10 minutes before baking and really be sure to wrap the bacon around all of the cheese to reduce the cheese ooze.